The nanite is a minimal ATtiny85 based development board intended to be used with a breadboard. It is intended to be powered via USB, so no power regulation, but comes with a reset switch. 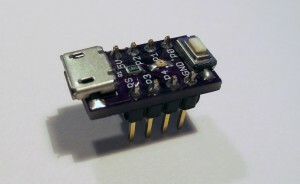 The pin out is identical to a DIP ATtiny85, so you can use it as a drop in replacement during development.